When my sis and I were in Dallas a few weeks ago, we stumbled across the Habitat for Humanity ReStore and decided to duck in. I'm glad we did! I found some super cheap plywood pieces for an upcoming project, and this little $5 beauty. I liked the shape of it and picked it up intending to repaint it. But you know what? I'm kinda loving it as is! I swapped out a shade from a lamp I'm not using right now. 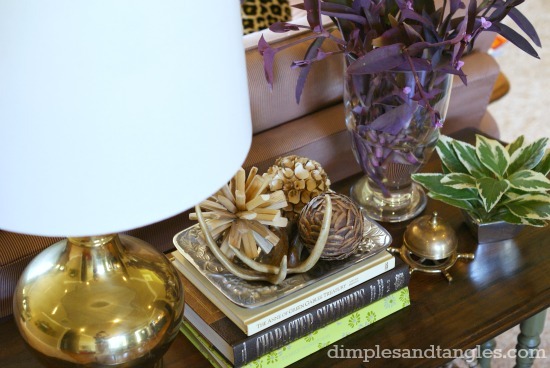 I love the warm metal tone, it's perfect for fall! *Steer clear of a finish that is too glaring and shiny and bright yellow, look for a warm mellow glowing tone. *The shade should be a crisp, modern shape. *And while you're at it, mix those metals up a bit. Go ahead. It's o.k. 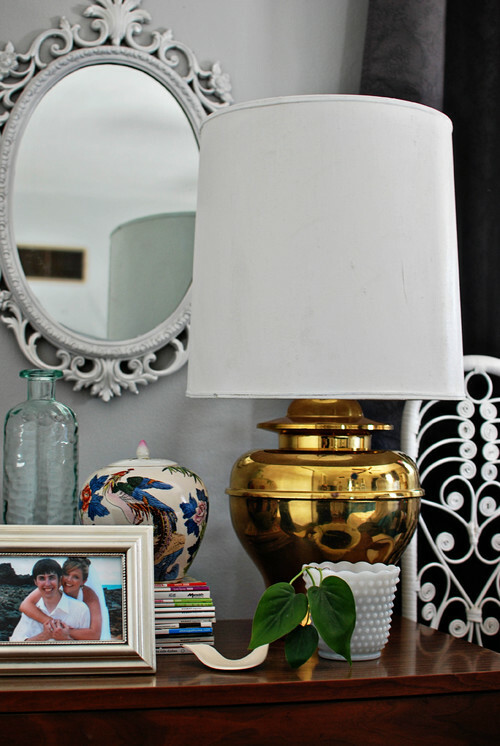 Mandi found this beautiful lamp at a thrift store and toned down the bright brassiness with-our favorite-Rub N Buff. Good find! I love brass right now! I absolutely love aged pieces of brass. I have a lamp, tons of candle sticks & some decorative pieces. Your find was great! 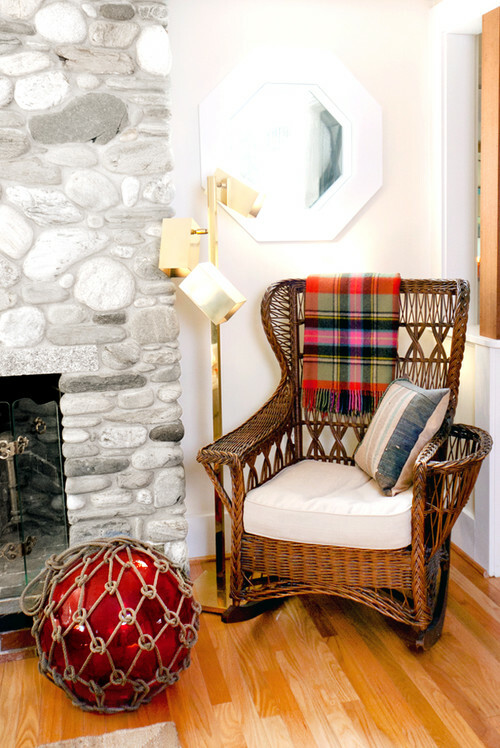 Great find, and your styling is spot on, as usual! Love the one with the black shade on that rustic table! I love both lamps, great finds! 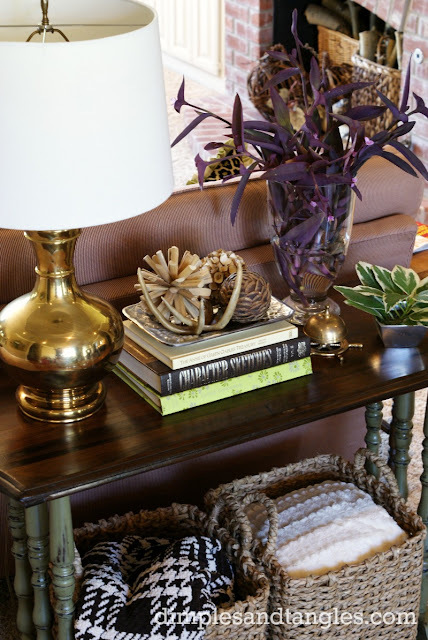 Your sofa tables vignette is beautiful! I love gold frames and brass in certain items. Not a fan of brass knobs unless paired with black doors. I also like certain types of brass with certain light fixtures. I do not care for brass faucets ether. I guess as an accent piece is where my tastes lay. 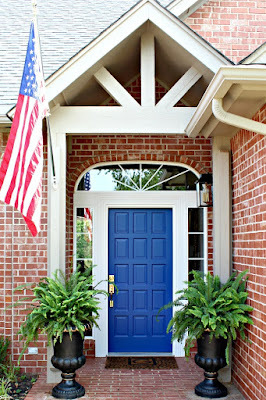 You make me want to jump in my car and head for my ReStore because I Love, Love, Love Brass!! I kept mine (even when it was "out") and I snag any and all I see at Thrift Stores too (boo, now the prices may go up). I love a bit of brass here and there - and that shape is great. 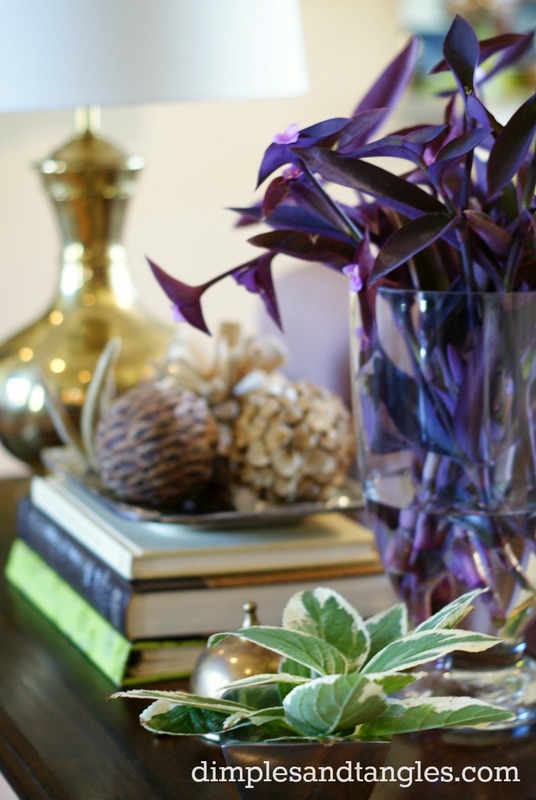 Looks so perfect on your table - I love how you style! 5$ wow what a find! I want to go shopping with you! Hehe. Love it!! 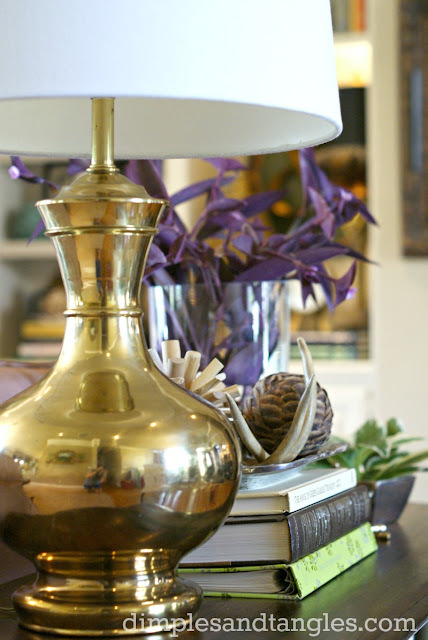 You have inspired me to pull out some of my old brass candlesticks!! LOVE IT! So very true about brass! I hate rules anyway! Do what you LOVE right? Everything seems to run full circle doesn't it? :) Your lamp looks wonderful! I subscribe to using what you love, not what "someone" says you should. 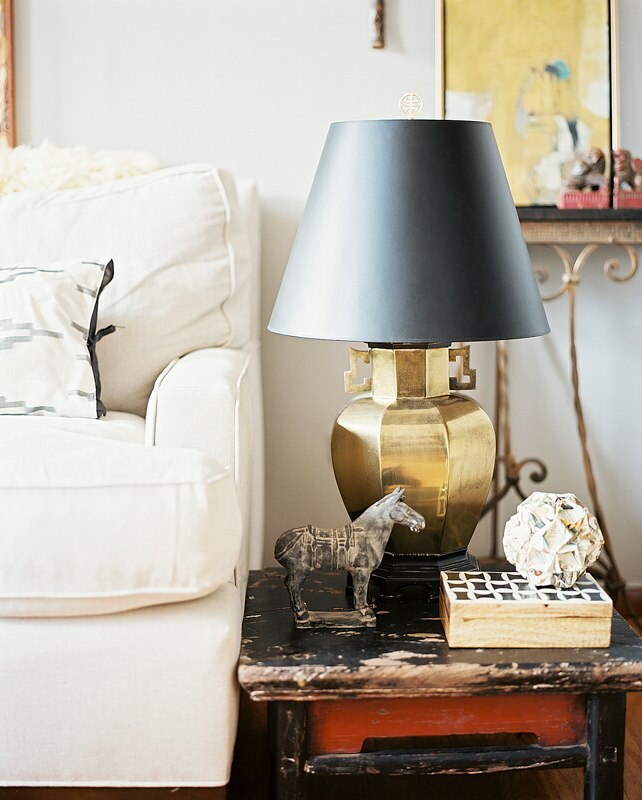 I have always owned brass accessories and think it is such a nice bold element to add to any room when mixing up the metals. Great examples here; love your finds. I love that brass is back. It brings such warmth. I totally agree - don't go too yellow, though. Great examples! The way you have illustrated the use of brass in house painting is wonderful. 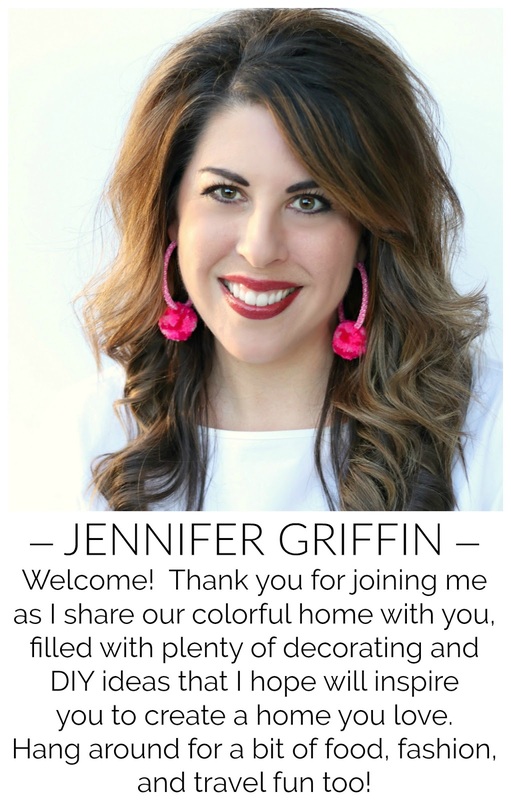 I, too, happen to own a few pieces of brass and am looking forward to using them in the redecoration of my home. share values in the early August stock market meltdown.